Cookie Monster, Elmo, and Abby Cadabby were interviewed on Rocketboom. Some readers of this blog already know that my favorite Sesame Street character is Cookie Monster, because he eats with such passion. While I am not going to eat like that, his passion is still quite inspiring. 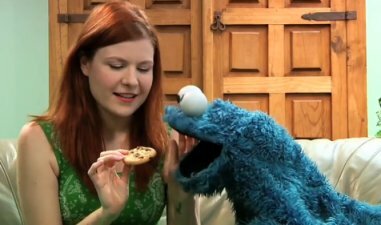 In this interview, I learned that the term “nom nom nom” that people had been using on the internet to express their desire for something yummy (literally or metaphorically) came from the noises Cookie Monster makes when he eats. How cool is that? Got to love Cookie Monster. Some people said that they think it’s great that Cookie Monster is now teaching children to not just eat cookies all the time and that a cookie is a sometimes food. He is telling viewers that it’s good to have a balanced diet with lots of veggies and fruits. On the rational level, I can understand that. I guess, as part of the cast of an educational program on PBS, he has a responsibility to say those things, but it just seems totally out of character to me. It’s like making a movie about how Jesse James sits down with his enemies to talk about their differences peacefully, sort things out and make out with one another. It might be sending a good message about peace and talk, but that’s simply not what Jesse James would do. Hi Kelvin – I used to love Sesame Street – especially Cookie Monster. But like you say, I have a hard time imagining him educating kids on nutrition. Your Jesse James comparison is a great one. I grew up in Taiwan, so I didn’t really watch Sesame Street as a kid. Instead, I watch it as an adult because it’s entertaining. Cookie Monster doesn’t do as much in the episodes nowadays. It’s all Elmo now. The Sesame Street website is great though. It has lots of videos all categorized and tagged. I’ve been watching a bunch of Cookie Monster stuff, especially the sketches with Prairie Dawn. Will write about that later. I agree with you. He’s COOKIE monster for goodness sake. I know, right? It’s like Oscar teaching cleanliness and saying he doesn’t like trash. It’s just not right. Speaking of these guys, their cousins (The Muppets) have a Christmas movie that I’ve never seen! Then again, I don’t think I ever saw the whole Muppet Movie either. Shame on me! I better go update my movie queue! Last time I attempted to tape Letters to Santa but failed. Don’t know if they’ll run it again this year. I should update my movie queue (which doesn’t even exist) sometime. Like you, Cooke Monster has always been my favorite Muppet. Though Sesame Street is a learning tool, taking the most beloved Muppets out of character is downright WRONG. My own children learned much from Cookie Monster: greed is ugly, living in a garbage can is not something to which they aspired, one can have fun with a seemingly disrespectful character…the list is quite long. We ALL loved Cookie Monster for his genuiness. What were they thinking? OOPS! Now maybe the CTWS can come up with a character to help with typos – particularly when spelling one’s own name! Ria actually has a nice ring to it too. Well, the new episodes are mostly Elmo, Abby, and Murray anyway. And I became less interested in the story. I sort of just watch it nowadays to admire how good Elmo is at playing at the camera. It’s great for learning puppeteering techniques. Not really a fan of Elmo myself. I guess it’s over-saturation on that character. I’ve never seen the newer episodes with the other characters. Although I can say that from seeing Leslie Carrara-Rudolph on stage, I might enjoy Abby. Abby’s recurring segment is done in computer animation though, but at least the animation mimics the motions of an actual puppet. I don’t know. On one of the new episodes I saw, there’s a segment with animated Cookie Monster, another with animated Bert and Ernie, and another with animated Abby. They are entertaining, but I still would rather see the puppets. Telly is my favourite of the puppet characters and sense introduction of Abby and Murry we don’t get much Telly. Cookie is pretty high on that list. Cookie monster has always ate everything cause I remember he was always talkin about his mommy’s lasagna in addition to cookies and he has eaten a phone on the show back in the day. Perhaps they are pushing veggies to much. However i know his character well so it’s not really out of character for him. Sadly Elmo is taking over sesame street and personaly I hate that. I can tolerate Abby and Murry. Me like Telly,Big Bird,Count and Cookie Monster the beast. Yeah, they seem to be more focused on the more kid-ish characters like Elmo and Abby these days. I don’t mind Murray and Ovejita but I do hate the fact that Murray had to keep announcing the next segment. I’d rather just see what was the next thing to come up instead of being told what’s coming up next.